Magaldi Group has been awarded the prestigious "Impresa Oltre Salerno" prize promoted by Confindustria Salerno. During today's Public Assembly of Confindustria, Mrs. Letizia Magaldi (Head of Institutional Relations and Member of the Board) received the award from Mr. Vincenzo Boccia (National President of Confindustria) and Mr. Mauro Maccauro (President of Confindustria Salerno). 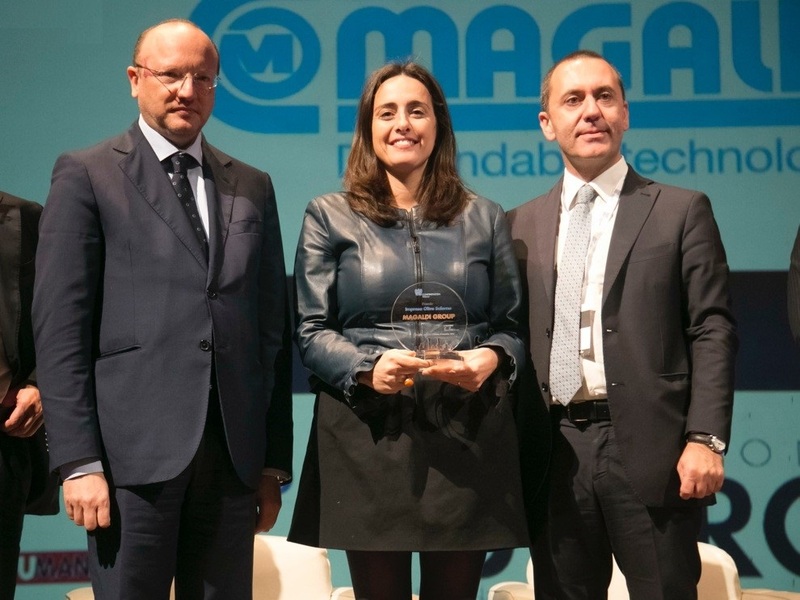 The award, dedicated to Companies based in Salerno (Italy) and successfully operating in international markets, has recognized Magaldi Group for its natural propensity to the internationalization. Boasting over 100 years of history, Magaldi Group operates worldwide through its subsidiaries (Magaldi Power Pty Ltd in Australia, Magaldi Power GmbH in Germany, Magaldi Power India Pvt. Ltd. in India and Magaldi Technologies LLC in USA). With more than 1,000 installations worldwide, it generates 85% of its turnover abroad, exporting to 40 Countries all around the world, supported by an international sales network which counts 50 between agents and representatives. To further confirm its international role in developing dependable technologies, Magaldi has recently patented an innovative Concentrated Solar Power (CSP) system – known as Solar Thermo-Electric Magaldi (STEM®) – able to collect solar energy and convert it into thermal energy to be used immediately or stored and extracted when desired, using sand as thermal energy storage. This green technology is expected to revolutionize the solar power sector, supplying electricity and steam heat to remote zones with absent or difficult grid connection.